Viral fevers are seen all over the world, and viral fever symptoms can affect all age groups from the smallest infant to the elderly. A small number of viral fever cases are deadly, but most of the time viral fever is not serious and it will go away on its own or with home care and over-the-counter treatment of the worst symptoms. Viral fevers can be highly contagious, however, so they have a tendency to spread very quickly. 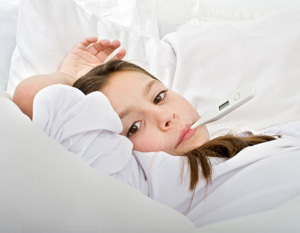 In general, a viral fever is an infection in the body that is caused by a virus. This type of infection leads to a spike in body temperature once it has manifested itself in the body. Viral fever is unique in that it is most often treated and overcome without the true virus that caused the problem ever being determined. Skin rashes can also accompany a viral fever, but not always. Viral fever symptoms can last anywhere from a few days to weeks or even months, in very severe cases. The fatigue and cough have been known to last longer than the other viral fever symptoms. Viral fever is most commonly spread in 3 different ways: direct contact with the virus, breathing infected air and eating or drinking contaminated food or water. Viral fever can also be spread through sexual contact or be injected directly into the blood stream via shared needles. As stated above, some viral fevers are highly contagious and will spread rapidly through the air or by contact with infected people. Once the virus enters the body, it can take several days before the viral fever takes hold and symptoms begin to become apparent. This is part of the reason for the quick spread of viral fever. Sufferers are out and living their normal life without realizing that there is a virus taking hold and getting ready to make them pretty sick. Since most cases of viral fever are not serious, there is usual no need for medical care. Most of the time, people with viral fever take over-the-counter medication to treat the aches, pains and respiratory symptoms and the fever goes away within a week or less. As with any illness, if the symptoms persist for more than a week or any discomfort or pain becomes severe, a visit to the doctor or emergency room may be necessary. This always depends on the person and each illness is different. The best way to treat viral fever is to get lots of rest and keep up the fluid intake. While medication may alleviate the symptoms, it will not cure the virus or make it go away. The body must rest and get back to health by fighting the viral fever on its own. There are some extreme cases where antibiotics may be used to treat a viral fever, but this is not the most common or preferred treatment for this type of illness.